Big or small, your household appliances and electronic devices consume a lot of energy. On average, they consume 20% of the total energy used in your residence. The refrigerator is the biggest energy guzzler, followed by the freezer, the washing machine (if it uses hot water), the dryer, the dishwasher and the stove. Even though their energy consumption is constantly improving, substantial energy savings can still be made if your choose appliances whose power and size correspond to your needs, and if you make optimum use of these appliances. Smaller appliances provide substantial savings in energy consumption, while extending the life of your big appliances. Consequently, when you have a choice of using one or the other, opt for the smaller one. Whether it is a microwave oven, a toaster oven, a crock pot, a tea kettle, a coffee maker or an electric skillet, don’t be afraid to use them as often as you can. If your refrigerator is next to your stove, dishwasher or a sunny window, it has to work harder to maintain the desired temperature. Regular cleaning of the cooling coil underneath or in the back of the fridge helps maintain good performance and can save up to 12% in energy consumption. Do you really need a freezer? A freezer is almost as much of an energy guzzler as a fridge. If you’re not the sort to stock up on provisions, then the freezer compartment of your fridge should fulfil your needs. If you want to buy a freezer, keep in mind that horizontal or chest freezers consume less energy than vertical or standing freezers. The rule of thumb to determine what you need in a freezer is half a cubic foot per person in the home. By using a microwave rather than the oven in your stove when cooking small quantities of food, you’ll save energy because a microwave oven consumes five times less energy. Keep in mind that it must be airtight, with nothing preventing the free circulation of air around the appliance. By using an electric skillet rather than the burners on your kitchen stove, you have more control over the cooking temperature and you consume less energy to obtain the same results. For the same cooking time, a toaster oven consumes two times less energy than the oven in your stove. Compared to the burner on your stove, an electric tea kettle can use 40 to 70% less energy, while an electric crock pot uses up to 50% less energy! By selecting an appropriate size coffee maker, you avoid wasting both energy and coffee, while ensuring that you’ll always have hot, fresh coffee on hand. Approximately 85% of the energy consumed by a dishwasher is used to heat up the water. You should rinse your dishes in cold water, wait until the machine is full of dishes before using it, use the short cycle option and let the dishes dry by opening the door rather than using the hot air drying cycle. By washing your clothes in cold water, you’ll save more than 50 litres of hot water per washer load, or about $50 a year. Replacing a conventional washing machine with a front-loading model allows for significant savings of energy and drinking water. By using the spin cycle twice, you remove more water from the wet clothing. Your dryer then won’t have to work so hard to dry your clothes. Clean the lint filter frequently, and make sure that the exhaust duct and outside vent are not obstructed. On sunny days, hang your clothes outside to dry. Where can I find the regulations regarding the energy efficiency of appliances? 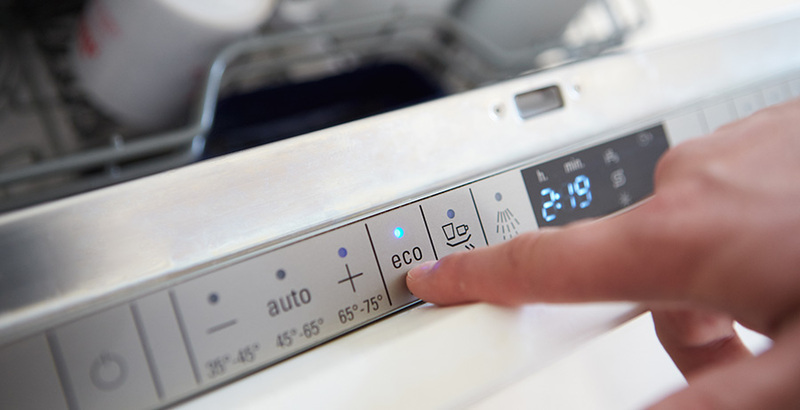 If the appliance is manufactured and sold in Québec, consult the Loi sur l’efficacité énergétique d’appareils fonctionnant à l’électricité ou aux hydrocarbures which monitors the energy efficiency of appliances powered by electricity or fossil fuels. If the appliance is manufactured in Québec but is exported elsewhere, consult the Guide to Canada’s Energy Efficiency Regulations. Provincial regulations regarding the energy efficiency of appliances apply when the appliances are manufactured and sold in Québec. Federal energy efficiency regulations apply when appliances are exported. When shopping for a large household appliance, the international ENERGY STAR® label is a symbol of energy efficiency at its best. Products bearing the ENERGY STAR® label will help reduce your energy and operating costs by 30 to 50%. You’ll also be helping the environment. For a refrigerator, you can save upwards of $80 per year. Order the brochure (ISBN : 978-0-660-20695-0) at 1 800 387-2000. ‹ Central air conditioner or heat pump?